Eczema is a skin condition characterized by itchy, scaly spots and can be caused by a wide variety of underlying conditions, including poor food quality, toxins in the environment, allergies and psychological problems. Dogs with eczema often have areas on their skin where the hair has grown thin. Eczema is treatable, but is often a chronic condition. The top priorities in treating a dog that suffers from eczema are to determine the underlying cause for the condition and to treat the symptoms. Often, pet owners treat the symptoms without treating the underlying cause, which brings the dog some relief, but does not last. Consultation with a conventional or holistic veterinarian is often necessary to determine what is causing your pet's problems with eczema. Often, the first recommendation a vet will make is to switch your dog to a higher-quality food. The second recommendation will generally be to ensure that your pet and home are flea-free and that you are not using products in your home and yard that are known to be skin irritants. Conventional vets may prescribe antibiotics and steroids to speed healing and treat or prevent infection. Holistic vets may prescribe specific holistic and homeopathic medicines, but will also be likely to recommend some natural remedies. A common natural remedy for itchy, irritated skin is oatmeal. Oatmeal can be used as a bath treatment or mixed with water to create a paste to be applied to itchy areas. Oatmeal bath packages are available at most drug and super stores and can be added to bathwater to make a soothing soak. Try not to bathe your dog too often, however, as constant application of hot water, soap and the friction of scrubbing can aggravate eczema. Chamomile, an herb commonly available in supplements and teas, can also be used in the bath or as a topical treatment. To make a chamomile poultice, brew a strong cup of chamomile tea (available in grocery stores), allow the tea to cool until it is slightly warmer than body temperature, and apply a rag or cotton ball soaked in the tea to your dog's affected areas. Dried calendula flowers are also often recommended as a rinse or tonic for inflamed areas due to their natural properties. Dried calendula is available in some health food stores. Calendula is applied using the same methods as chamomile. Witchhazel, available in drug and grocery stores, is an astringent that can also be applied to hot, itchy areas to soothe irritation. Tea tree oil, a natural antiseptic and astringent with soothing qualities, may help a dog's skin as well. Caution must be exercised with tea tree oil, which will burn if applied directly to the skin and must be diluted to be used. Tea tree shampoos are available that may be effective. Some pet owners find that adding nutritional supplements to their dog's diet can also help with eczema symptoms and may address some of the underlying causes of this skin disorder. Natural oils, such as Evening Primrose, Omega-3, fish oil and vitamin E, may help the dog's skin regain its moisture balance. Garlic is often recommended to chase away fleas that may be contributing to itching and irritation, as is brewer's yeast. Dog-sized doses of many of these supplements are available at pet supply stores and online. Pro-biotic supplements that help to control candida yeast may be helpful for some dogs as well. 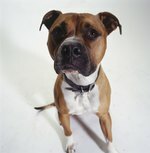 A simple way to increase the amount of pro-biotics your dog is getting is to feed him a spoonful or two of yogurt daily. Organic, plain yogurt is least likely to contain any ingredients that may further irritate a sensitive dog. Supplements containing candida-controlling pro-biotics are also available.